The statistics tab gives you a brief overview of the most liked products in your shop. The results are ordered by the amount of wishlists the products can be found in. The wishlist statistics are also used to send promotional mails to customers and display the users who have a particular product in their wishlist. The amount of wishlists can sometimes be lower then the affected users. This stems from the script not filtering the amount of wishlists by customers. If one customer has the same product in more then one wishlist, the wishlist count will go up by two, but the resulting users will only be incremented by one. Clicking this button starts the process of creating a new promotional mail. Gives you a list of users that have the selected product in atleast one of their wishlists. Promotional mails are designed to be coupled with coupons but they are not required. 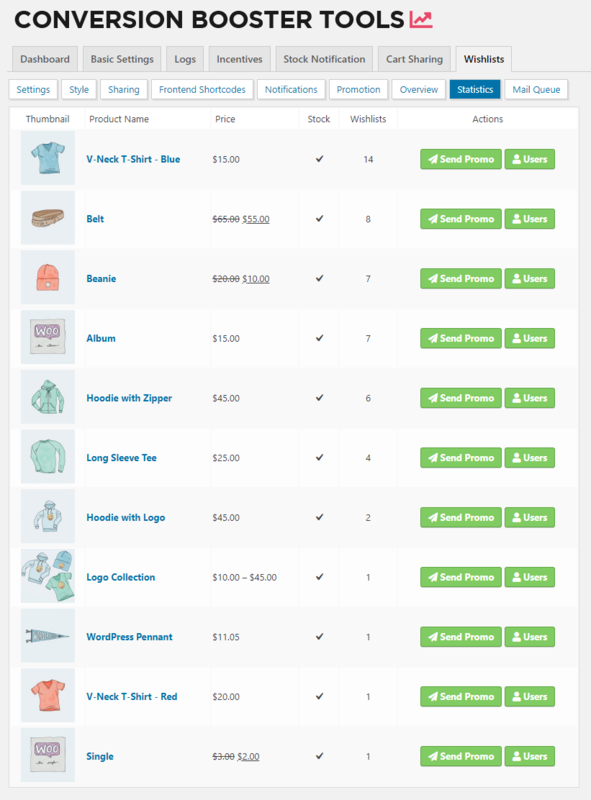 You can create coupon codes directly in the WooCommerce settings. The coupon code that should be coupled with this promotion. You can choose „– No Coupon Code–“ to not use a code. In that case the shortcodes displaying coupon code information will not display anything. 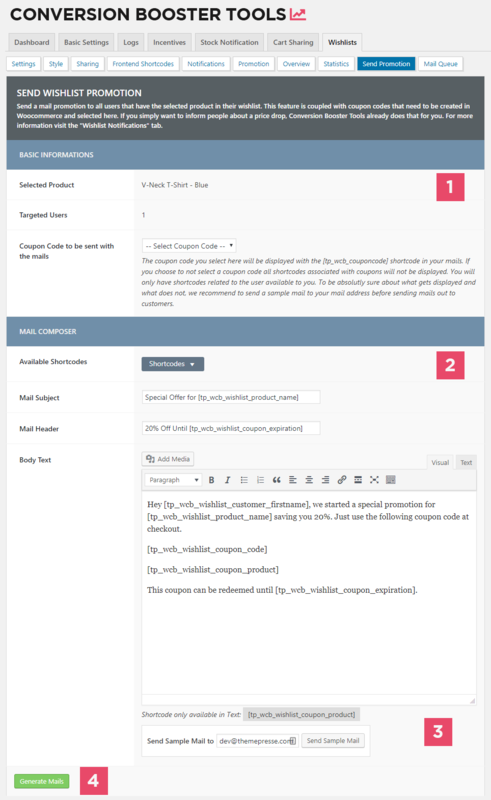 The mail composer automatically loads the default template for new promotional mails. You can change the default template in the „Notifications“ tab inside of the admin settings. In order to personalize the promotion there are some handy shortcodes available to you. Tipp: You can also insert custom images into your promotional mail. This can be used to make your emails nicer to look at. To see what your promotional mail will look like you can send yourself a sample mail. The sample mail will automatically include all the changes you made in the form field until that point. You don’t need to save the current page for your changes to take effect. Clicking this button will generate all mails. The mails will be sent to the mail queue meaning they will not be sent out directly. You will instead be forwarded to the „Mail Queue“ tab.